Best Tools for Arts Business :The right art tools can give you the freedom to bring your artistic vision to life. Here’s 21 items every artist should own. If you’re getting ready to set up your own workspace. 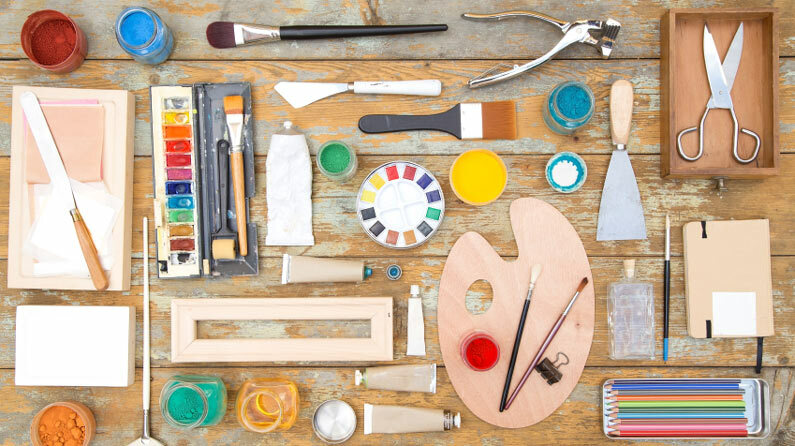 There’s a selection of art tools you’ll need to get started. Whether you want to create a new piece with your best pencils. Most of us started drawing when we were young. Back then, materials and tools were not that important to us. Perhaps, they weren’t even considered. A standard pencil on some notebook paper would often “do the trick”. But as we grew and developed as artists, the materials and tools that we chose became more important. The connection between quality art materials and quality artwork becomes noticeable along the way. And it’s no wonder that emerging artists desire to have the very best materials possible. If you are starting to get serious about your artwork. No matter what age, you may also be starting to get serious about the materials that you use. In this post, I’ll offer top essential drawing materials. And tools for artists that are just starting to get serious about their drawing. Wooden and mechanical, Staedtler, Derwent and Pentel, pencils are an essential art tool for creatives. Find a brand you like working with and make sure you have always have a quality and varied selection close at hand. We’ll start off with the most obvious essential – quality drawing pencils. When it comes to drawing pencils, each artist will find a brand that they connect with. There’s no way to know which brand will become your favorite until you try a few. Pencil sets usually come packaged in nice tins and can be great because they often include the full spectrum of graphite grades. Many sets include pencils with harder graphite (9H) through softer graphite (6B). Harder graphite makes lighter marks and keeps a sharp tip longer. While softer graphite makes a darker mark, but needs constant sharpening. These sets give the artist the ability to work with many different values and varieties of mark. Many artists will find that they don’t use all of the pencils in a drawing pencil set. Instead, they may find that they only use a few of the pencils. For example, 2H, HB, 2B, and 4B pencils would be plenty of range for most of us. If this is the case, then a pencil set would not make sense. Instead, purchasing the individual pencils as they are needed is a more logical approach. Whether you’re working on a piece for your design portfolio or a new logo design, a sketchbook is an art tool. If you’re the hunt for a new one, we’ve got a great selection sketchbooks for creatives. One of which is sure to meet your requirements. A sketchbook is one of the most important things an artist can have. I should point out that I am referring to an “active sketchbook” – one that receives attention on a daily basis. Anyone can “own” a book with blank pages of drawing paper. But the one that actively gets drawn in on a daily basis is the one of value. Let me make an analogy to a sketchbook’s importance. Let’s compare a professional athlete’s life to that of an artist’s. Or on the track to enhance their performance on “game day”. The exercise is important – if not crucial to the athlete’s success. An active sketchbook is the artist’s “exercise”. It is the “hard work” that goes into the development of the artist. And it is the breeding ground for innovative, artistic ideas. Though the sketchbook may never be seen by the world. it is the often driving factor in successful artworks and successful artists. A drawing can be made on any surface. But the quality of that surface is sometimes just as important as the medium that it is used upon it. The “Tooth”– The “tooth” of the surface is the texture of the paper. The texture of the paper plays a role in how the drawing material is accepted on the surface. Heavier textures will produces lines that may appear “broken”, while smoother textures will produce smoother lines and gradations of value. 2.Paper Weight– The weight of the paper refers to how much a ream (500 sheets) of that paper weighs. For most papers, the weight of the paper will be directly related to the thickness of the paper. It should be noted that some papers may have a heavier weight but actually be thinner. For example, 80 lb. paper will typically be thicker than 60 lb. paper, while 100 lb. paper will be heavier than 80 lb. paper. 3. Acid Free– Paper that is “acid free”, without going into all of the technical details, will stand “the test of time”. This paper is will not yellow over time and is more resistant to fading that can occur when exposed to UV light. Drawing Paper– Medium tooth paper that is suited for drawing with a variety of drawing media including graphite, charcoal, and colored pencils. Charcoal paper – Heavier tooth paper that is lightweight – almost semi-transparent. Bristol Paper– Smooth tooth paper that is heavier (think cardstock). Excellent for creating smooth gradations of value, or detailed line work with ink. Like pencils, no artists workstation would be complete with an eraser. This malleable putty will remove graphite from most surfaces – an essential art tool if ever we saw one! Erasers are for mistakes – right? Think again. Erasers can be a great mark-making tool as well. Each eraser creates a different mark and should be used as necessary according to the specific drawing medium. Rubber Eraser – Your standard eraser for erasing graphite. This eraser uses friction to remove any material from the surface. Kneaded Eraser – This eraser lifts material from the surface, instead of using friction to remove it. It can be pulled and fashioned into different forms to create specific marks. This eraser gets dirty over time, but can be cleaned by pulling and “kneading” it. Gum Eraser – “The Crumbler”. This eraser is great for removing media from surfaces that are sensitive to tearing. A gum eraser removes the medium through friction, but crumbles as it does so – preserving the surface. Vinyl or Plastic Erasers – This eraser is the toughest of the bunch. It can erase almost anything. But be warned – this eraser can tear the paper if you’re not careful. Pencils need to be sharpened with a quality pencil sharpener. Use a poor quality sharpener and you could be out of a pencil in a matter of moments. Pencil sharpeners generally fall into two categories – Manual and electric. Electric pencil sharpeners can vary in price and the old saying, “you get what you pay for” is true for what you get here. A quality electric pencil sharpener will sharpen your pencil without eating it all up. But should not be used with colored pencils. The waxy binder found in colored pencils can build up within the blades of the sharpener, ruining the device. I’ve had the pleasure of working with the X-Acto Commercial sharpener. It is a MAJOR pencil sharpener. One negative is that smaller pencils can get caught inside of the sharpener. This sharpener is definitely on the extreme side of things, but a cool commodity to have around. while an electric pencil sharpener has its appeal, a manual pencil sharpener will do for most of us. Like electric pencil sharpeners, the manual varieties come in different forms. My favorite is a simple, handheld metal sharpener. It’s a cheap and easy solution that is portable and easily replaced. There are more options to black and white drawing other than drawing with graphite. No artist’s toolkit would be complete without charcoal or conté. Charcoal provides a broader range of value and mark-making than what’s possible with graphite. The manner in which marks are made is different as well. Charcoal comes in both stick and pencil form. Sticks of charcoal are usually either “vine” or “compressed”. Vine charcoal is softer and produces lighter marks, while compressed charcoal – which is concentrated, produces darker marks. Charcoal pencils can be sharpened like graphite pencils, making them great for details. Conté is similar to charcoal in richness of color – however the makeup of the material is different. Charcoal is burnt organic material, while conté is made of clay constituents. If you prefer to work with pens, make sure you have a varied selection of the brand you like working with close by. There are thousands of pen brands to choose from, Faber-Castell, for example, have a lovely selection. I absolutely love felt tip pens. Felt tip pens allow the artist to create a variety of marks. The tip of the pen allows the artist to create a broad range of line quality. An added benefit to a felt tip pen is the psychological effect that it can have on the artist. Using a medium that cannot be erased forces the artist to be more deliberate with their marks. As a result, a bit more thought is put into the marks that are made. You can actually improve your drawing skill by using a felt tip pen. Blending stumps are essential for the artist wanting to smudge or move material around on the surface. (through finger smudging) which can make a drawing look dirty or uncontrolled. And smooth applications of value in areas of detail that may be hard to get to otherwise. Even those works that you’d rather not let anyone else see are important. They need to be treated with respect and stored in manner that will keep them preserved and protected. There are more than a few options for storing artwork, but the most popular option is a portfolio. There are many different portfolio options out there on the market – each with their own benefits and drawbacks. If you are looking to add a portfolio to your collection, I would suggest looking for a couple features. Rigidness– Look for a portfolio that will keep your artwork from bending. Most portfolios will do this, but there are a few cheaper versions that may not. Look for a portfolio that has a rigid support system. Size– When purchasing a portfolio to store your work, be sure that you provide yourself some room for larger works. Don’t just purchase the 18″ by 24″ portfolio because all of your works up to this point are smaller than this size. And you’ll wish you would have opted for a larger sized option. You don’t have to buy a portfolio when you can build your own. With a couple of rigid pieces of cardboard and tape, a portfolio can be created fairly quickly. Taking care of your artwork is important – but taking care of your materials is important too. Finding a suitable storage solution is easy. Let me offer three different solutions for three different situations. The Portable Container– When I was an art student in college, I carried around a tackle box filled with my art materials. So we were all forced to carry around theses modified tackle boxes. These days, there are plenty of portable solutions that are fortunately designed for artists. Many of these feature stackable trays and levels and are long and deep enough to accommodate brushes and other important tools. The Semi-Portable Container– Larger varieties of the portable option exist as well. I call these “semi-portable” because while you can lug them around – they are really too large for daily use. But, they can provide exceptional organization for your art supplies and tools. The Permanent Stack –If the need doesn’t exist to be carrying your art materials all over the place, then a more permanent solution might be the best option for you. “I use Langton satin-smooth hot pressed for most of my work,” says artist Dave Kendall. Many artists prefer to paint on masonite boards. These can easily be purchased and cut to size from timber or hardware merchants. The starting point of your next masterpiece, right? Canvas boards can be bought ready or custom made from most art shops. With time and experience you will be able to create your own. Used by painters to support the hand that holds the brush. Or you can follow the video above and make your own. Versatile, vibrant and affordable, acrylics can be painted on anything. “Liquitex and Finity from Winsor and Newton are the makes I use the most,” Kendall comments. If you want to get started or prefer painting with oils. There’s a wide range available from traditional to fast-drying and water mixable. Watercolor is a versatile and flexible medium that can yield a variety of results. They come in tubes and as dry cake versions. They are a top art tool to have as part of your collection. Great for adding brilliant colour, and useful for glazing if dramatic colour is needed. There are many types of easel available. Your choice should be based on how much room and money you have to spend. And Daler-Rowney and traditional wood palettes for oils. Choosing the paint brushes for your next project isn’t always an easy decision. After all, different effects require different tools so it can be difficult to know which to use. If you’re struggling with which paint brush to use, the best thing to do is to try the various shapes. Remember, it takes time to become familiar with the various shapes. Practice makes perfect. To preserve your oil paintings, you’ll require a final picture varnish. Gloss and matte are available from various providers for this purpose. By no means are all of these materials and tools required for serious drawing. You really only need a mark-making medium and a surface.